QWhat exactly is charity? I always thought charity meant giving to the poor, but it sounds like your church uses that term differently. aCharity is the act of loving others. That love in the Bible often goes by the Greek word "agape" which carries a connotation of self-sacrificing love. That love is the Lord's kingdom come to earth. As Emanuel Swedenborg phrased it, "The Lord's Kingdom is mutual love in which alone is peace." QI know I should be helping others, but I have barely time to take care of my own needs and those of my family. How can I do it all? aTime is a challenge especially in this day and age. But we can always make time to help in ways big and small. It is not about doing it all. It is about doing what we can. Mother Theresa famously wrote, "We can do no great things. All we do is small things with great love." So are there small things you can do? Are there bigger projects or events you can work on just a couple of times of year? The time commitment is actually relatively small when seen in relation to impact. QWhat is a way to make a real difference in the world, and help others? aWe make a real difference most importantly by our presence. We cannot shy away from the suffering of the world and so we need to ask a hard question, "What breaks your heart?" This is probably where God is calling you to serve. And what is the main tool you bring? Your presence. 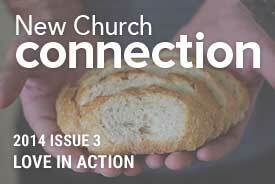 Our job, as the New Church teaches, is to deliver our best intentions on God's behalf. Find those intentions to help and prayerfully ask God where they should be directed. Expect answers to start appearing quickly! QJesus said that we should sell all that we have and give to the poor. Do I really need to do that to follow Jesus? aFor some people that might be the answer. For others, not. But the spirit in those words is true for everyone. How do we "sell" those things we have in excess or that we no longer need in order to serve? As one author noted, we find God with empty hands. I would say we serve others with empty hands as well, empty of judgments, empty of our critique, and open to love and connection. Chuck Blair is the head pastor at NewChurch LIVE in Bryn Athyn, PA. For more information, visit www.NewChurchLive.tv .